E. I. Couse was, perhaps, the most famous of the members of the Taos Society of Artists during the period of active production from the group. A highly specialized artist with a rigorous academic background, Couse painted serious figurative scenes of the Indians of Taos Pueblo, usually crouching and often fire-lit. Born in Saginaw, Michigan in 1866, Couse studied briefly at the Chicago Art Institute, spending hard-earned house painting money on his courses. After three months, (the most he could afford) Couse returned to Saginaw to earn enough money to enroll in the National Academy of Design in New York City. He received an award from the Academy in every one of the three years he studied there and, in 1887, spurred on by his success at student exhibitions, he enrolled in the Academie Julien in Paris. In Paris, Couse studied under Adolphe Bouguereau and Robert Fleury, and the work he produced garnered awards in every student exhibition he entered. It was in Paris that Couse first connected with two individuals who would be central to his life and development; the first was his future wife, Virginia Walker, and the second his mentor and the man who first brought Taos to his attention, Joseph Henry Sharp. Sharp was the central figure in organizing the Taos Society of Artists. It was from Sharp that Couse, Ernest Blumenschein and Bert Geer Phillips first learned about Taos, and he is widely considered the spiritual leader of the Taos Founders. After studying at L’Ecole Des Beaux Arts, Couse continued to live and work in France, painting French countryside scenes that proved eminently saleable in Europe and the United States. He and Alice had their first son, Kibbey, in the coastal village of Etaples in 1894. Couse also began painting portraits, which married his established academic style to the study and documentation of the human form. He kept a studio in New York that he occupied only during the winter exhibition season, and successfully sold a great number of paintings. In 1897, the Couse family moved to Oregon, just south of Alice’s childhood home, onto a ranch owned by her family. Couse built a studio and painted the Klikitat Indians of the area. Four years later, he moved to New York City permanently, drawing upon his sketches and paintings of the Northwest Indians to create Native American-themed works that proved quite popular with New York buyers. After the exhibition season, without any pressing engagements, Couse allowed himself to be persuaded to travel to Taos to visit Phillips and Blumenschein. He rented a house next door to Phillips’ studio and began painted the people of the Taos Pueblo. He would spend every summer between 1902 and 1926 there, eventually establishing permanent residence there in 1927. Couse used the same two individuals, Ben Lujan and Geronimo Gomez, as the subjects for the majority of his paintings. Though the lines and colors of Couse’s work are quite smooth, it is possible to see Lujan and Gomez age over time. Usually they are kneeling or squatting, engaged in a quotidian task such as preparing food or crafts, and are often lit by firelight. In the daylight scenes, Couse used a soothing palette and a softness of tone and detail to create peaceful scenes of the natives’ relationship with nature. Though Couse’s pieces are less ethnographically accurate than some of his contemporaries, his handling of his subjects is enormously generous and unforced, with a relaxed quality that impresses in its ability to convey concentration or rest with very little facial or muscular detail. 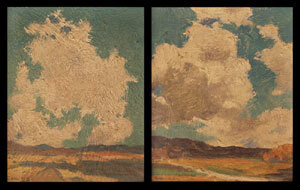 In 1914, Couse painted his first piece for the Santa Fe Railway. Over the rest of his life, he would paint twenty-two canvases for the railway, usually included in their yearly calendar. Only two of the pieces were commissioned; the rest were chosen by the railway out of Couse’s stock of existing work. E. I. Couse died in 1936 a successful and famous painter, whose gift to western art was significant and who is still recognized today as a major figure in the development of a significant school of American peinture.